(TibetanReview.net, Jan30, 2015) – North Korea and Chinese-ruled Tibet were among the “worst of the worst” while China and Laos were only slightly better, said the US-based rights NGO Freedom House in its annual survey of political and civil liberties in 2014. 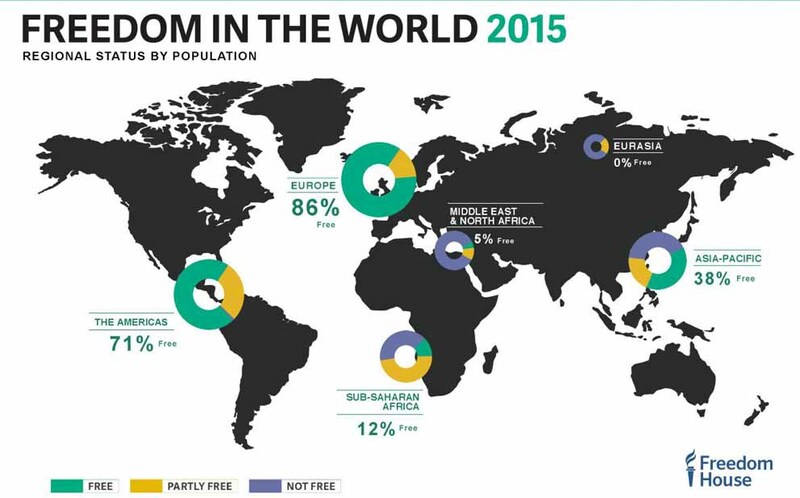 The survey report, “Freedom in the World 2015”, published on Jan 28, said North Korea and Tibet were included in the “worst of the worst” 12 countries or territories in the world because they received the lowest possible score of 7 in Freedom House’s ranking scale of 1-7 in each of the two categories measured by the rights group: political rights and civil liberties. On Xinjiang (East Turkestan) the report said that China’s “harsh state repression” of Muslim Uyghurs appeared to have triggered “an escalating cycle of radicalization” that resulted in deadly attacks attributed to Uyghur extremists. “The government responded with heavy-handed collective punishment and more intrusive restrictions on religious identity,” the report added.